Dr. Lacin was born and grew up in Izmir, Turkey where she earned her DDS at the Dental School of Aegean University. After graduation, she practiced dentistry in Izmir and Istanbul for ten years. Dr. Lacin moved to Michigan where she attended the University of Michigan Dental School for her residency program. She completed a three-year master's program in restorative dentistry in 2005. She served as an adjunct faculty at the U of M Dental School for five years. Currently, she is a full-time practitioner at Gentle Dental Associates. While her career has mostly been focused on preventive and minimally invasive dentistry, she is also trained and experienced in cosmetic dentistry. Dr. Lacin enjoys all aspects of dentistry and is grateful to be in such a fascinating profession combined with such a good dental team. Dr. Lacin knows that it is essential to stay current with the latest developments in oral healthcare. By pursuing continuing education, she is able to serve her patients by meeting their care needs with the latest proven treatments and technologies, such as Same Day Crowns. She feels very fortunate to be involved in a constantly changing profession. 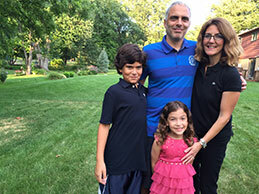 Dr. Lacin lives in Ann Arbor with her husband, Sinan, their son, Kaan, and daughter, Mina. Her favorite hobby is spending time with her family. She also enjoys traveling and getting up early for a walk before the sun rises.